Author(s): Dik-Lung Ma, Department of Chemistry, Hong Kong Baptist University, Kowloon Tong, Hong Kong, China. Modi Wang, Sheng Lin, Quan-Bin Han, Chung-Hang Leung. The G-quadruplex structure is a non-canonical secondary DNA motif that is built from planar tetrads of guanine residues stabilized by Hoogsteen-type hydrogen bonding. Bioinformatics studies indicate that sequences rich in guanine that are able to form G-quadruplexes are widely distributed throughout the human genome, particularly in telomere and promoter regions of genes. G-quadruplex sequences found in the promoters of human oncogenes, such as k-ras, c-myc and bcl-2 have attracted particular attention as molecular targets for therapeutic intervention due to their potential capability to regulate gene expression at the transcriptional level. Moreover, the G-quadruplex structure has been associated with a number of human diseases arising from defective telomeric maintenance. Despite intensive research in this area, however, the actual function of G-quadruplexes in vivo has not yet been fully understood. 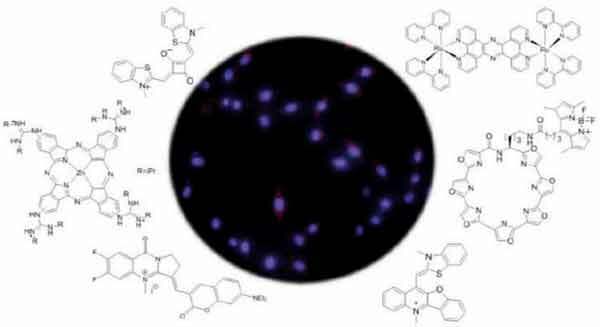 Therefore, significant efforts have been devoted to the discovery of specific probes for visualizing and distinguishing G-quadruplex structures from other nucleic acid molecules likely to be found in biological environments. This review summarizes recent studies in the development of G-quadruplex probes over the past three years, with a particular emphasize on the detection and imaging of G-quadruplex structures within living cells. Furthermore, the detection and biological relevance of RNA G-quadruplexes is discussed. Keywords: Cell imaging, G-quadruplex, Probe, DNA. Affiliation:Department of Chemistry, Hong Kong Baptist University, Kowloon Tong, Hong Kong, China. Keywords:Cell imaging, G-quadruplex, Probe, DNA. Abstract:The G-quadruplex structure is a non-canonical secondary DNA motif that is built from planar tetrads of guanine residues stabilized by Hoogsteen-type hydrogen bonding. Bioinformatics studies indicate that sequences rich in guanine that are able to form G-quadruplexes are widely distributed throughout the human genome, particularly in telomere and promoter regions of genes. G-quadruplex sequences found in the promoters of human oncogenes, such as k-ras, c-myc and bcl-2 have attracted particular attention as molecular targets for therapeutic intervention due to their potential capability to regulate gene expression at the transcriptional level. Moreover, the G-quadruplex structure has been associated with a number of human diseases arising from defective telomeric maintenance. Despite intensive research in this area, however, the actual function of G-quadruplexes in vivo has not yet been fully understood. Therefore, significant efforts have been devoted to the discovery of specific probes for visualizing and distinguishing G-quadruplex structures from other nucleic acid molecules likely to be found in biological environments. This review summarizes recent studies in the development of G-quadruplex probes over the past three years, with a particular emphasize on the detection and imaging of G-quadruplex structures within living cells. Furthermore, the detection and biological relevance of RNA G-quadruplexes is discussed.